Exceptional brand new remodel! Prime Ocean Front at the Milowai Complex in the quaint harbor village of Maalaea (the most central location to all points of interest you will want to explore). Milowai is known for the abundance of turtles that frolick and feed right out front everyday and for also overlooking the famous freight train waves that kick up when Mother Nature decides! Bedroom suite provides a brand new comfy king size Serta bed with it's own 40 inch Roku smart tv. Beautifully remodeled bathroom with spa like tiled walk-in shower. Living room has a queen size sleeper sofa (8" thickest most comfy mattress one can buy), recliner chair, 50 inch Smart Tv with Netflix, Hulu, etc... Blueray DVD player, Free secured wifi , internet, cable and own in-house washer and dryer. New Kitchen has stainless steel appliances, granite counter top and very well stocked for the cook in mind. The elevator is conveniently located nearby and parking is assigned. Other coveted amenities to enjoy are of course the large pool, very nice and inviting bbq and dining area, pool side lounges. What more could you ask for...book today! Exactly as expected! Between the property description and the other reviews, our expectations were spot on. Condo looks to have been recently renovated, decently stocked with cooking utensils, and very clean. Views from the Lania were fantastic and only a few people ever seemed to be in the pool area at any one time. You'll have to go to the end of the street opposite the harbor for access to Haycraft park/ beach. If you are staying anywhere in Maalaea, you will need a car. While planning the trip, I expected to drive to Kihea for groceries and restaurants. But we actually found that the drive back to Waikapu, Wailuka, and Kahulai seemed quicker, easier and with more selection to our tastes. We would definitely stay here again. Amazing Stay This place was perfect for our getaway. When we first walked in we noticed that not only was the place clean but it was a fairly new remodel, there were flowers on every thing and little chocolates on the counter with a welcome package. It was a nice little touch. The location was great as this is only 20 minutes from OGG airport and only 5-15 minuutes to Kihei or Lahaina and although there isn't a beach at this complex, beaches are only a 5 minute drive away in either direction. As the days went on and we had more time in the unit there were several things that we enjoyed such as having binoculars in the tv cabinet. That was a great addition as we were able to watch several humpback whales come in and out of the bay. Having a coffee maker and filters so that you could enjoy the sunrise on the patio with a fresh poured coffee. The communal BBQ's were great and we were able to use them almost every single night and it seems as though everyone in the complex respects the property because they were always clean. There are also a couple things that could be changed but if they weren't, it wouldn't stop us from returning. The place does get quite hot and with only 1 window A/C unit and a fan, the heat can linger through the night. We did request a second fan to which the manager happily supplied. Many of the neighbors have portable A/C units in the bedrooms and it probably wouldn't hurt this place. There also isn't alot of supplies. Alot of the places we have stayed whether its vrbo or a competitor tend to have spices or condiments but the only spices were salt and pepper. We went out and grabbed condiments and some more spices to add but not sure if it ends up staying with the unit. When you are only travelling for 7-10 days its quite pricey to buy jars or bottles of something and only use 1/4 of it. In regards to a few other reviews where people mention that its windy, we stayed for 8 days and never once found that it was windy. There was definitely some wind and a breeze but it wasn't blowing your hat off windy. When it was hot, the wind was somewhat welcomed. I would highly recommend this place. You cannot beat the view or the peacefulness of the area. Do be aware that you may have some unwanted guests (bugs) once in a while as its just part of Maui's ecosystem. The sugar cane fields are close but management does a great job having the interior and exterior sprayed everything 3 months. Make sure to keep screens and doors closed. Perfect location .Ocean View.Super clean This cute condo was centrally located on the island. We were never more than 20 minuets from any activity. The condo was equipped with all the essentials. There is a beach within a 5 min walk from the condo ( when you go out the condo turn right and go to the end of the block). The condo is equipped with all your beach needs. The pool is a nice size never over crowded.Around the corner there is pub on harbor nice for a cocktail with a view. The condo was spotless and newly updated. The management company for the condo was very helpful and friendly . My happy place I have to admit, I was near tears as we were following GPS. I thought I had booked in the North area per the city listed in VRBO. I was worried that we were in the harbor and not on the ocean. Well we get inside and were beyond surprised with the beautiful home inside. The bed was super comfy, everything was crisp and new. They thought of everything you could possible need including a misc junk drawer! The pool was nice, but the view of watching turtles was the highlight. Spectacular!! This location actually ended up being very centrally located which made it easier to get anywhere we wants to go. We made amazing memories and will treasure our time that we spent there. Relaxing Oceanfront Condo - Perfect Stay!! Stayed here in early March 2018. 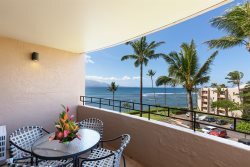 Condo is situated in a perfect location in Maui, close to the airport and convenient for driving to Lahaina, Kihei, and Hana. It was clean, well-stocked, quiet, and was an amazing home base for my Maui adventures. The owners have done a wonderful job with the remodel, and condo is tastefully decorated with beachy decor. Laying on the super comfy couch listening to the waves in the harbor was the perfect way to end every evening. I would not hesitate to book this property again on my next trip to Maui.